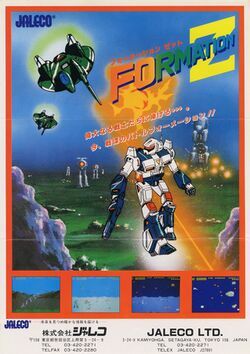 Formation Z (known as Aeroboto in the U.S.) is a shoot'em up game developed by Jaleco with a twist. The machine that you pilot starts out as a robot. By pressing and holding the jump button down, you will transform from a robot to a jet fighter plane (in a manner similar to the Robotech VF-1 Valkyrie). In this mode, you can travel extremely fast and cross bodies of water that the robot mode cannot. But you consume a supply of fuel, so you can't remain a jet forever unless you collect more fuel. Joystick: Use the joystick to advance and retreat the robot, and aim your gun high or low. Fire: Press the fire button to shoot you gun. You can aim the gun straight, or you can aim it high or low by holding the joystick up or down when you fire. Hold the fire button down to store up energy and fire a strengthened blast that will not stop when it hits an enemy. Jump: Press the jump button to make the robot leap in the air. The longer you hold jump, the higher it will jump. However, if you hold the button down until the robot jumps as high as he can, he will initiate the transformation into a jet plane. Joystick: Use the joystick to direct the plane in any one of eight directions. In this mode, you can climb rather high into the sky and away from the ground. Fire: Press the fire button to shoot you gun. You gun shoots in whatever direction the plane nose is facing, so it can be controlled by holding the joystick up or down when you fire. Hold the fire button down to store up energy and fire a strengthened blast that will not stop when it hits an enemy. Jump: Press the jump button to initiate the transformation back into a robot. You can only do this provided you are within enough view of the ground. This page was last edited on 12 March 2012, at 11:44.